"Water-bowl " was first presented by Cirque Du Soleil spectacle in a show Zumanity in 2009. What makes this dance and acrobatic show exceptional is its uniqueness, because it can be performed by only eight people in the world (and one in Poland)! 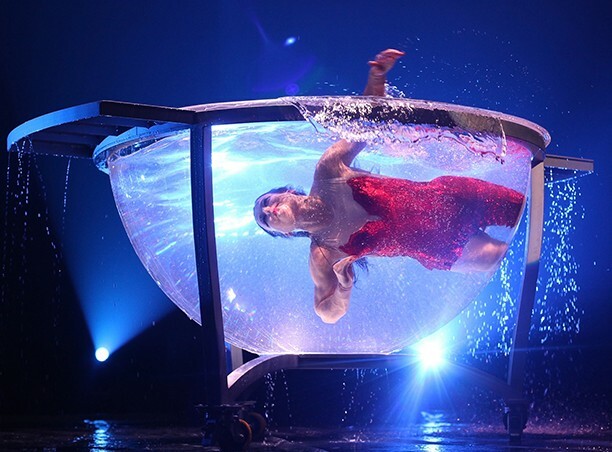 Water-bowl act combines the beauty of the female body with a magical underwater world, and it can be performed solo or in a female duet. The performance, as we can call it, makes an impression even on the most demanding audience . We guarantee memorable emotions, suspense, and delight all throughout the show. or acrobatics in a circle. This show was presented for the first time by Daniel Cyr at the festival in Montreal, where he won first place for the innovative character of the circus arts. This act shows the artist moving in a steel ring, proving his amazing skills of the control over the wheel following the rhythm of the dynamic music . You have a chance to see something which not too many people have yet seen, and watch the world of fantasy, in which the concept of gravity does not exist. also known as an air ribbon, an air sash or acrobatics on silk. It is an extraordinary spectacle, in which the artists move around the silk on the dizzying heights, presenting their grace, elasticity and strength. This show is incredibly attractive, blurring the borders between the world of illusion and reality. Aerial Silk duet is a real spine-chilling experience for the audience who are impressed by the mutual trust that the partners must have to each other while doing this dangerous air performance. Aerial duet acrobatics on a silk sash require from the artists an incredible strength and precision to perform dangerous stunts. dancing on hands. It combines the incredible power and flexibility of the artist with the difficult art of balancing on hands. It is a spectacle showing the unlimited possibilities of the "elasticity" of the human body. The difficult art of balance in combination with strength, passion and elegance of the female body makes a unique show, which captures the imagination of many viewers. 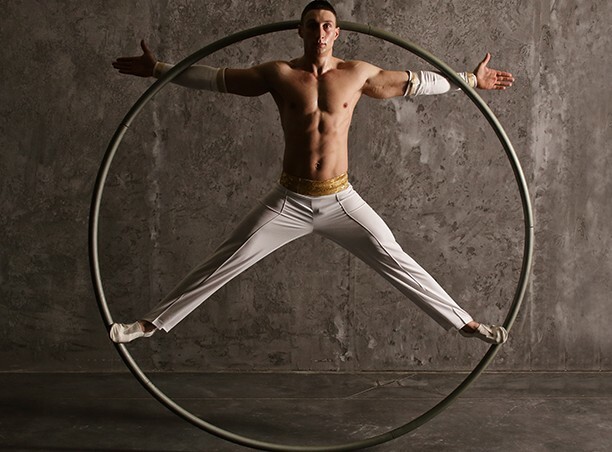 An artist presents a great performance on a steel wheel, which moves on different planes showing the audience elegance, flexibility and beauty. This show can be composed with delicate music to create a subtle delicate act, as well as be presented as an expressive and dynamic show. As the only company in Poland, we are in possession of equipment necessary to make this fascinating show. is a show in which an artist turns and swirls a huge block in the shape of a cube, filling the large space and evoking a sense of freedom. The physical strength of the artist enables him to take control over a huge block, thus creating a sense of lightness. The cube, balancing over the head, evokes incredible emotions. In combination with dynamic music an artist creates an exciting show, which can be additionally spiced by adding fire to the edges of the cube. It is a very spectacular show, which does not require a lot of technical preparations. female acrobatic trio. Is there a more beautiful image than that of three women, who gracefully present the most challenging elements of the sports acrobatics accompanied by music ? The trio is a unique feminine performance in which the acrobats show the most complex figures filling the room with energy, wonder and femininity. You just have to see it live! As one of the first artists in Poland and only few in the world, we are pleased to present an acrobatic show in a transparent sphere. 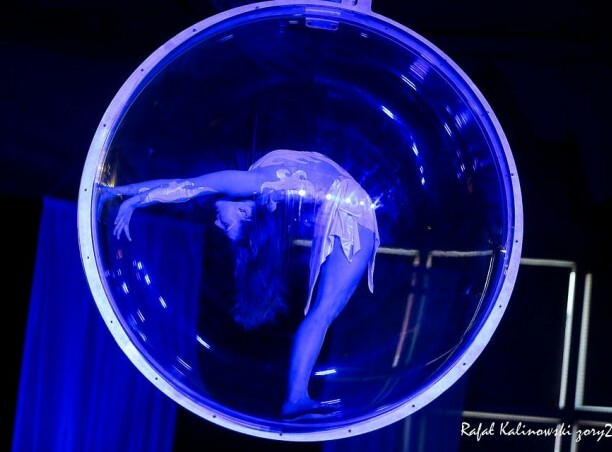 This unique show consists of the acrobatic stunts performed in the transparent ball which consists of two halves, therefore allowing to create and exceptionally spectacular show. An acrobat can present acrobatic figures both being inside the ball, and separating it into two halves, doing the splits and other stunts which enrich a show and provide great variety of effects. We hope you will trust us. We encourage you to contact us to arrange the details.